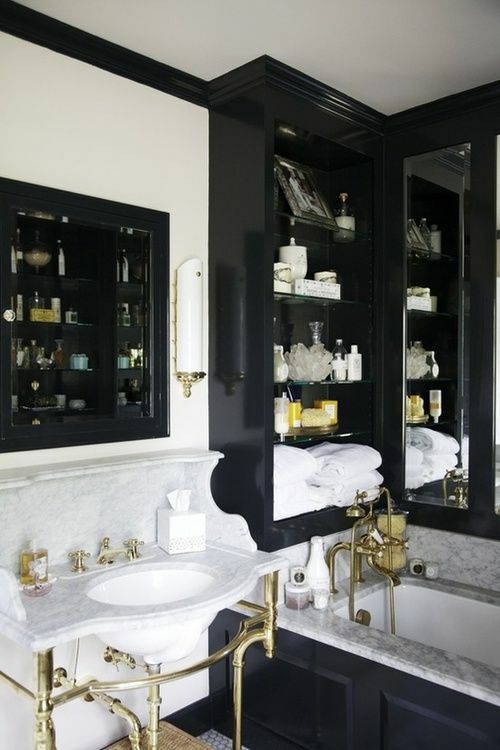 Have you noticed the trend for black bathrooms? These have been popular for a little while now but I am seeing more and more elements of this colour being incorporated in lots of different ways and it certainly seems like this is no passing fancy. If you love this trend but are worried about its longevity then I am going to show you ways that you can use this colour without committing to it for the long term. But I am also going to show you lots of beautiful bathrooms that really demonstrate how gorgeous this trend is. And you have to remember that unless you are renovating a house to sell, this is your home and if you love the look, it actually doesn’t matter whether it stays on trend or not. Remember to always decorate for you! 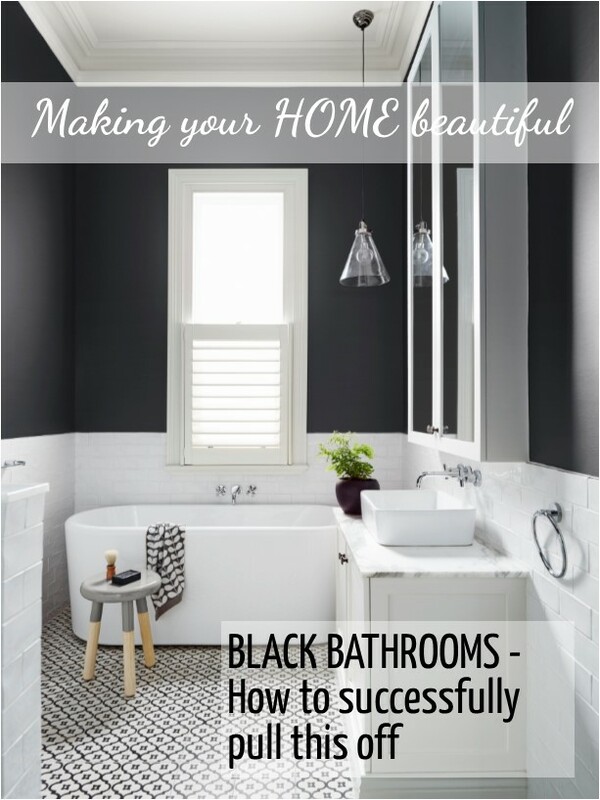 Black bathrooms – perhaps just a black freestanding bath? 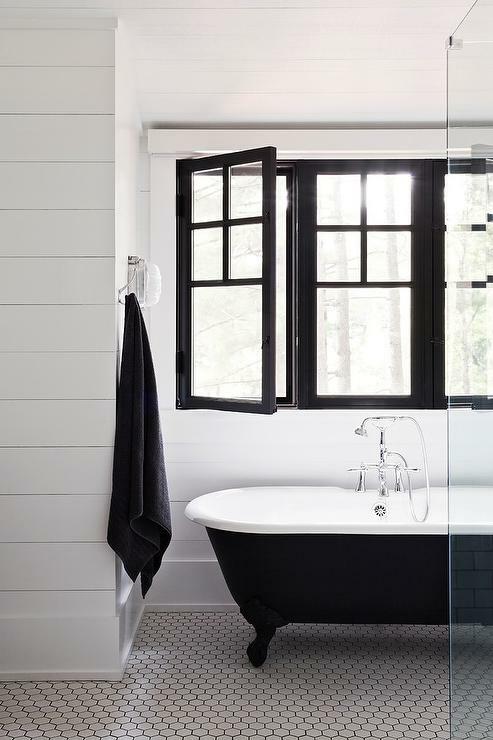 A simple way to add a touch of black into a bathroom is to use a black freestanding bath. I really love this one and with such a great feature, you really don’t need to bring in any other wow factors here. The old adage that less is more applies – keep the walls and flooring simple and let the bath take centre stage. Accessories like an elegant black chair to suit the style of the bath add a nice finishing touch – I love bathrooms that have a place to sit! 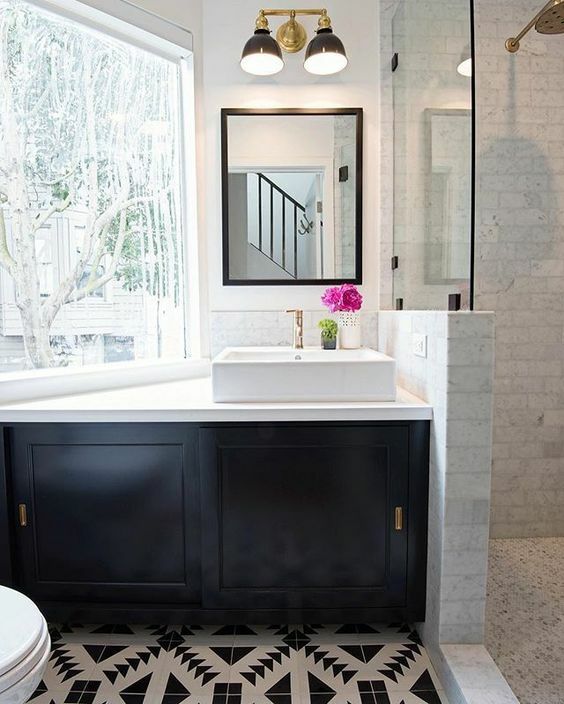 Instead of using black and white tiles in this contemporary space, the designer has opted for a smart dark grey but then introduced small elements of black. The clever design of the vanity unit perfectly reflects the black framed shower screen while the black tapware adds a nice contemporary touch. 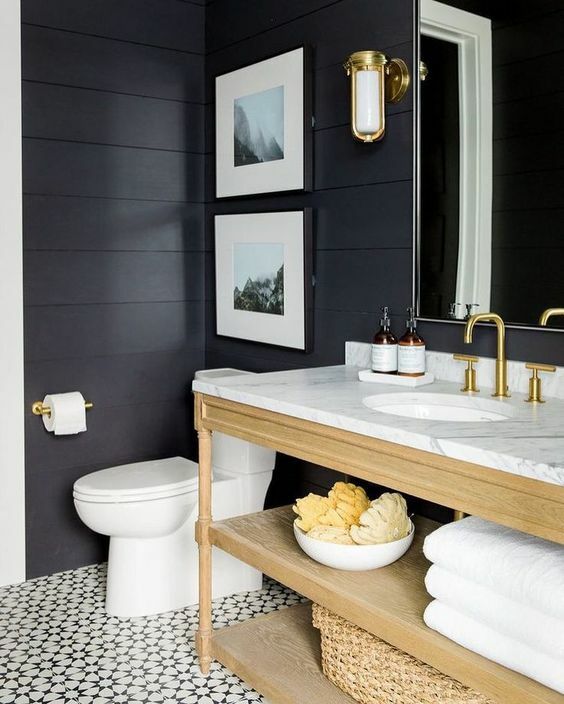 These elements can all be changed over time and you are left with a simple dark grey and white design that can be easily updated – bathrooms designed in this way are timeless. Very inspired! I was so pleased to see patterned tiles coming back into fashion and there are lots of bathrooms with these as a feature now. I love pretty things and these tiles really enhance a bathroom for me. I think you would probably either love or hate this trend but I know so many people who do that I hope it stays around. 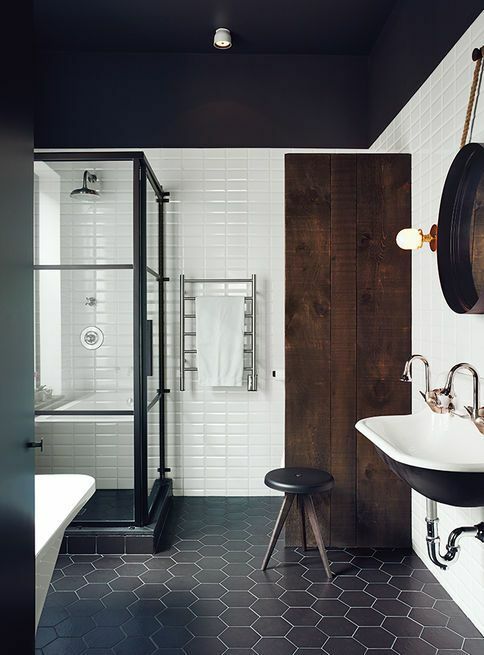 A great way to incorporate more black into a bathroom and to make these tiles more contemporary is to pick up the black in the wall colour. Paint is a great way to achieve this and the beauty of this of course is that if you get fed up with it, you can easily paint over the top (well, with a few coats anyway!). The colour used here is Domino, by Dulux – an almost pure black, but not quite, so therefore softer and easier to live with. This image of a more traditional style bathroom has used a true black for the joinery and cleverly extended it to the ceiling cornice which is a nice trick to define the edges and make the scheme come together well. You can see the difference in the black here and how the Dulux Domino above just takes a step back and although appearing black, isn’t as strong. This bathroom really is a glitzy space with the gold tapware and marble but again, if you tire of this look, then you can repaint the joinery in a white finish to completely change the mood and feel of the space. 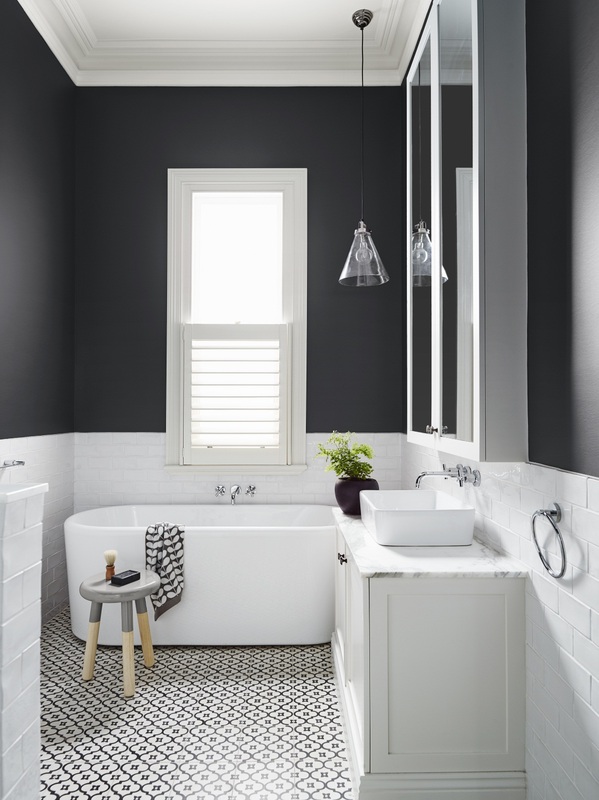 I love this image below as it demonstrates how you can introduce just a touch of black into your bathroom to completely change the look. This is one of my personal favourites, in style and colour as it is a fabulous lesson in the less is more concept. 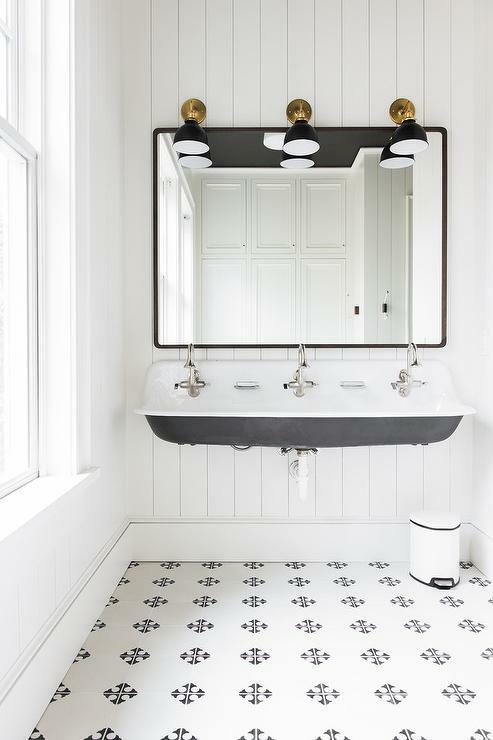 This bathroom scheme is restrained and simple but really effective and if you tire of the black, it is simply a case of updating the tapware, mirror and artwork – inspired. Another bathroom in this style but with more black on the walls and there are those beautiful pretty floor tiles again. 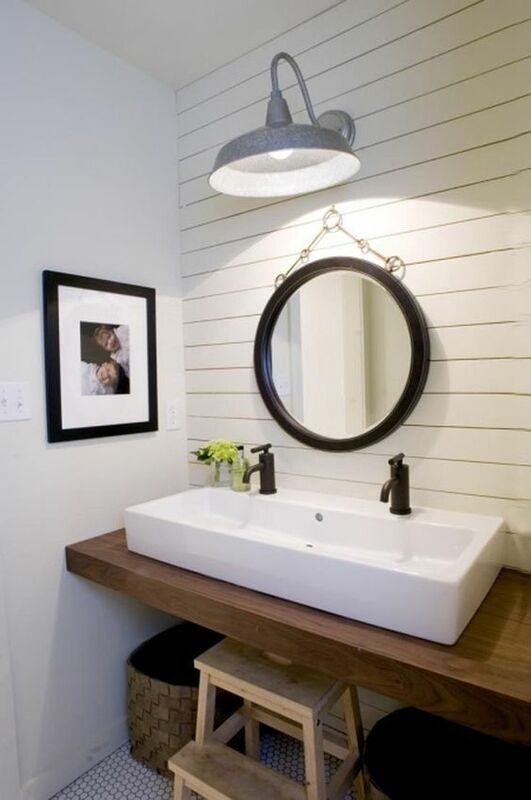 Picture this with white paint and you have a bathroom transformation with barely any cost. I really do love bathrooms with painted walls where possible as the updates are endless and the look is softer and less clinical than wall tiles. A black vanity works well in this awkward space as it defines the edges and makes a statement rather than a white vanity just filling the space and leaving it to look a little out of place. 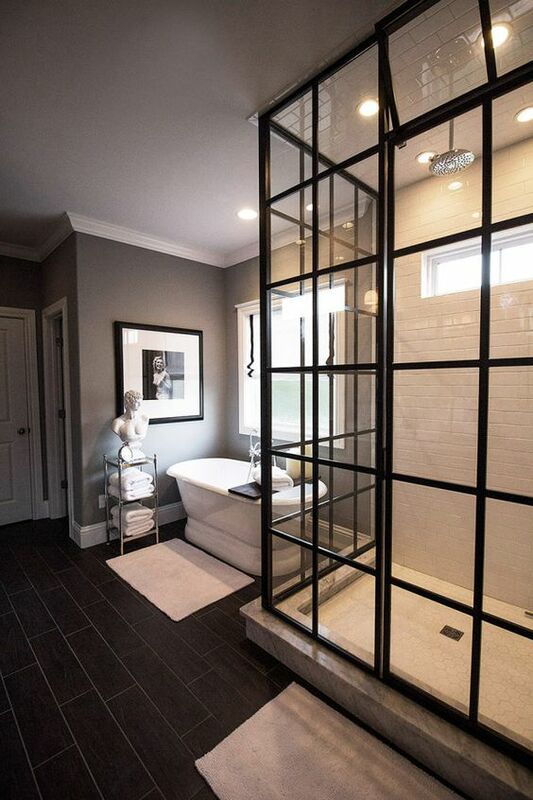 There are lots of lovely black elements in this bathroom design – fabulous shower screen, basin and mirror but what I really love about this room is how the designer has cleverly manipulated the space with the use of black. By using black above the tiles and on the ceiling, it lowers the height of the room and looks so much more effective than taking the white tiles to the ceiling which could look clinical. 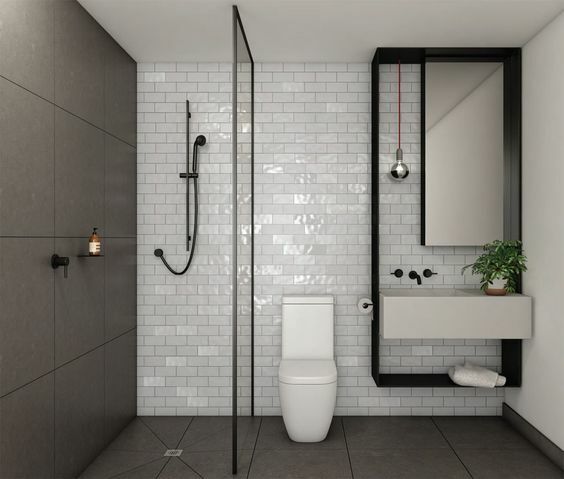 It actually looks as though the ceiling ends at the top of the white tiles and the strong elements like the feature door, black shower screen and mirror wouldn’t be as effective as they are without this clever trick. Here is another predominantly white bathroom with a black ceiling that you can see reflected in the mirror. With such tall white cabinets, the black ceiling helps to define the space and enclose it. With just some additional extra hints of black this is a great way to introduce some stylish notes into an otherwise very crisp white scheme. 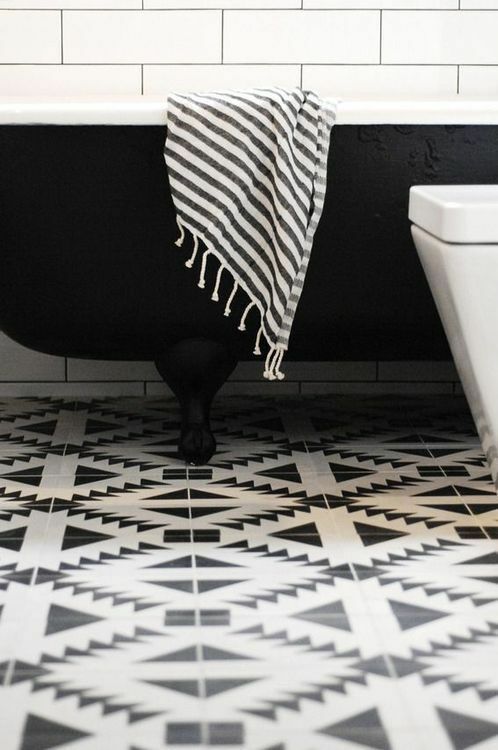 The black and white flooring in this bathroom has cleverly been enhanced with the use of black paint again. 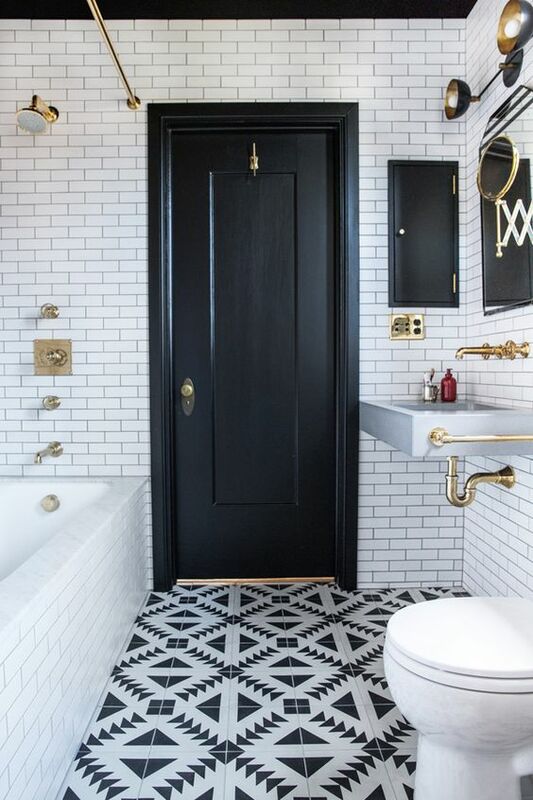 The door, architraves and ceiling are very effective painted in black and they help to tie in the dark grout in between the classic subway tiles. This is a timely reminder of how a touch of black in an interior scheme can greatly enhance the look. Forget about the classic black and white that we see so much of and remember that black is also a great partner to other colours, in particular to warm neutral tones. I really love this room below as it is just that – a proper room! It doesn’t actually look like a bathroom until you realise that the stunning black windows are actually a screen for a beautiful shower space and that there is a bath in the corner. Notice how the shower area is completely enclosed with even tiles on the ceiling? This way you can use a large degree of paint, fabric window dressings and artworks without worrying about the effect of lots of steam from the shower. So if you like the trend for black bathrooms you can see that they can be a classic choice but you can also simply introduce this beautiful neutral in small amounts to great effect. 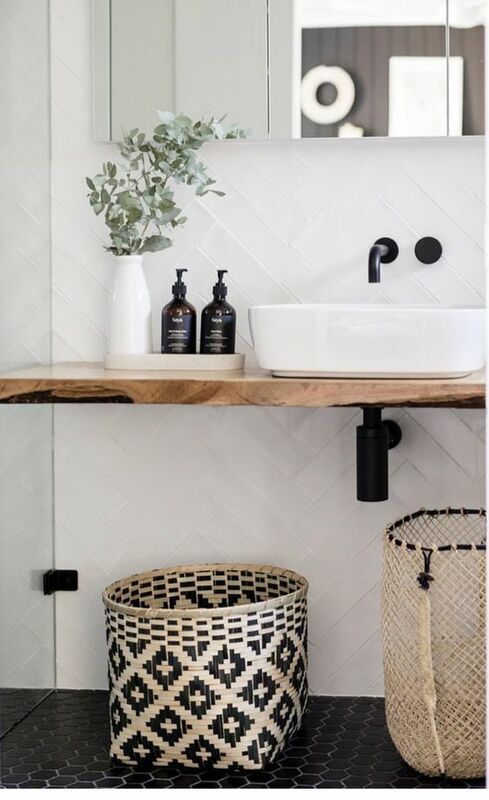 I have a huge amount of inspiration on my bathroom Pinterest board and would love to hear about your decorating plans and dilemmas in the comments section below. If you have enjoyed this article, you may be interested in my 5 quick and easy ways to update a tired bathroom. If you love to use black, particularly in a monochromatic scheme with white, then you may also find this article interesting as it gives you the basics of how to use varying tones to great effect.